For 3FM - the largest public radio station in the Netherlands - we designed and developed a personal festival concept for all major Dutch music festivals. To strengthen the relationship between 3FM and the major Dutch music festivals and its audiences, Next Empire created a concept called Festival Diary. We designed an app that enables visitors of music festivals to discover, collect, share and relive their finest music moments. We started by developing a beta-version of the concept, which mainly focused on reliving the festival experience. While being at the festival, users automatically build a diary based on their specific concert route (through tracking via GPS and iBeacons). After the festival, they receive a diary, consisting of pictures, unique festival content (supplied by 3FM and 3voor12) and a personal Spotify playlist. 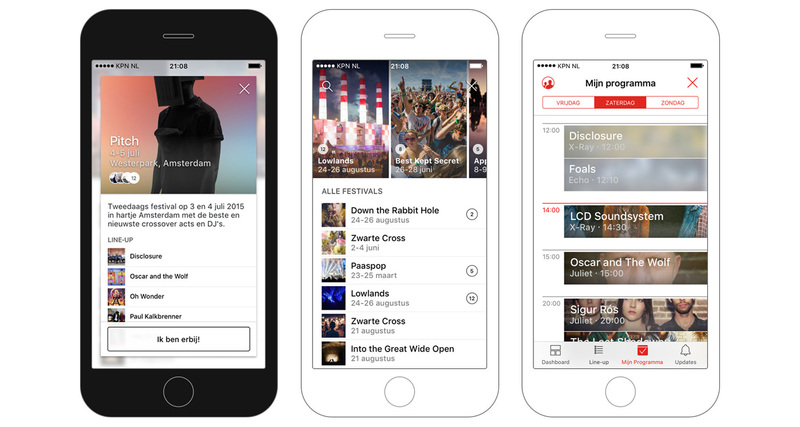 The Festival Diary app aired on 13 major Dutch music festivals in 2015. Based on the 2015 user feedback, we have further extended the in-app experience from after the festival, to also include experiential touches before and during the festival. The renewed app lets users easily discover the festival line-up based on their personal music taste (derived from Facebook likes and Spotify favorites) and metadata from Last.fm. It allows them to compile a festival program in advance, create and share a personal Spotify playlist, and optimize their preferences. The program serves as a guide throughout the festival. The app’s amplified Facebook integration - before and during the festival - enables users to see where friends are going and what their program looks like. We have also integrated photos and ratings (of performances) within the app, creating a 100% personal user experience. At the other end of the experience, festivals are able to use the concept as a platform to reach out to new and existing audiences. The custom CMS lets festivals design their own festival within the app, enables them to reach out to their visitors (through push notifications) and delivers live user feedback of the concerts at the festival. The same goes for 3FM, enabling them to strengthen the connection with both festival visitors and festival organizers. 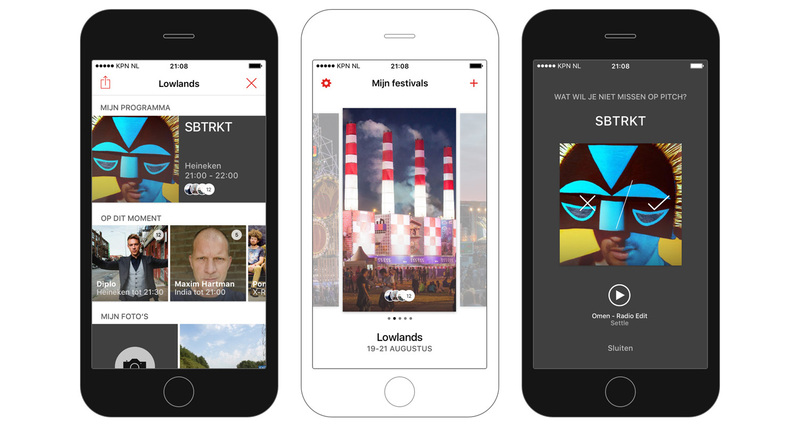 The Festival Diary app aired on 75 major Dutch music festivals in 2016. For this concept we built native apps (iOS and Android), as well as a custom CMS, including a tailor-made iBeacon management system. During this process we gained a solid understanding of iBeacon and GPS trackers’ optimization, both in terms of accuracy and battery life.